It's time for "Movies Jason Bateman Is In". First, "Up in the Air". I was really curious about this one since I travel so much for work. I was amazed out how much of my "on the road" experiences I saw in parts of the movie - especially over the last year. The intricate ballet of travel is captured perfectly, such as always having the right cards ready to check in for the flight or at the hotel and always scoping out the security lines at the airport to try to get behind the fastest person possible. It was truly fascinating to watch and not because I ever thought I was the only person to think about this stuff (there are far more 'effective' travelers out there than me). It's also interesting to see all of the personalities portrayed that you really see out there in the airports and in the hotels. It's almost like you're leading a double life at times. There are days where you wake up and have to really think about where you are for a minute. But, what really got me was not the travel but all of the people being let go. 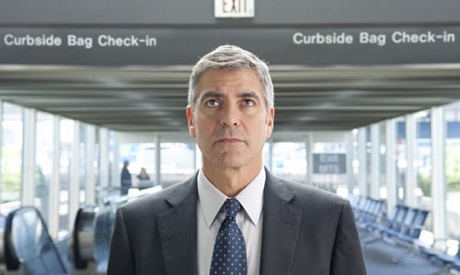 George Clooney's character terminates people for a living. Seeing the empty cubicles was striking. I've been a part of two major closures at work this year (one being my own location) and the images are just about haunting. There is one scene where George Clooney and Anna Kendrick are having a discussion in a office that is filled with orphaned office chairs. It sounds weird that it sticks out to me but I've seen it in real life and it's hard to get out of your mind that each chair was a person. There are so many reasons to see this movie and I can't go into them all here. The cast is brilliant. The writing is dead on. The filmography is simply stunning. It's one I will have to get on DVD and keep. And yes, Jason Bateman is in it and he is perfect as the boss back home that George Clooney's character rarely sees. Continuing my Jason Bateman theme is "Extract". 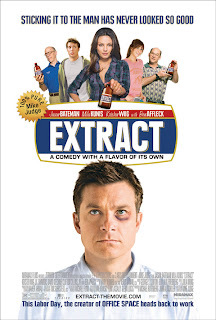 "Extract" is by Mike Judge who made the classic "Office Space" and "King of the Hill" and, yes, "Beavis and Butthead". "Office Space" is not a perfect movie and neither is "Extract" but what "Office Space" got wrong, "Extract" got right. As much as I laugh at and still think about certain parts of "Office Space" (TPS reports, the red stapler, "Jump to Conclusions", flair, etc.) in my day to day work life, there are certain parts of it that can just grind on your nerves. There are certain parts of the movie that make me cringe (maybe because it hits too close to home) and that just tires me out. "Extract" moves at a much faster clip and really can surprise you at times. Yes, it can be tasteless at times but it captures the factory environment to a tee. If you watch this movie and think someone won't sabotage the entire production line just to get back at someone they think is lazy (and thus risk the entire operation with no thought of it at all), I can tell you - you are completely wrong. Been there, seen that. I've also seen some pretty impressive forklift mishaps. The horrifying injury that becomes the centerpiece of the story is the one thing I haven't seen - yet. Still, I could tell you about some injuries and near-misses that will make your skin crawl. "Extract" is a very funny most of the time. Jason Bateman, again, is very strong. J.K. Simmons as the office supervisor is truly wonderful and I have a new found respect for Kristen Wiig (I still wish she would stop the annoying Gilley character on SNL before she ruins her career!). "Extract" - Worth the rental. Redbox is only $1. What are you waiting for? Just remember: not kid-appropriate!